Given the alcohol content, this caramel Drambuie pistachio fudge may be better used as a post-ride indulgence than an in-ride fuel, but it is still delicious. 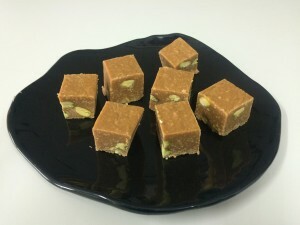 A salted caramel fudge is made fresh from butter, brown sugar and condensed milk. Drambuie liqueur is mixed into the caramel after allowing it to cool slightly. Biscuit crumbs are then added to soak up the excess liquid and pistachios are mixed in add a texture contrast. The recipe can be made gluten-free using crumbs from gluten-free commercial biscuits. In a medium saucepan, melt butter over low heat. Add dark brown sugar, condensed milk and sea salt and mix to form a smooth batter. Turn heat to medium and cook mixture for 20 minutes, stirring constantly as it browns and thickens to form a fudge. The mixture should be only just bubbling during this time. Making a good rich fudge at this stage is the key to flavour and texture in the final product, so be sure to use a timer and stir constantly. Once the caramel is cooked, remove from heat and let stand for 2-3 minutes to cool, then add Drambuie and mix in evenly. Add biscuit crumbs and pistachios and mix well. Spread the mixture evenly in a paper-lined square tin (*) and place in refrigerator overnight to set. Next morning, turn out and cut into squares. (*) Allow the paper to overhang the edges of the tin to assist in removing the fudge after setting. Alternately, you can use a silicone baking pan, which is flexible and will let you peel the tin away from the fudge.